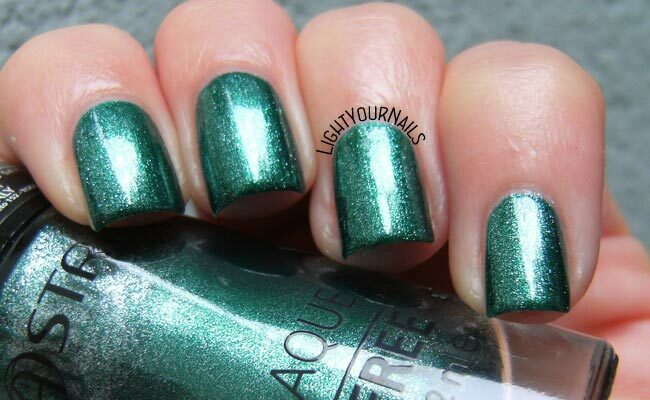 Astra myLaque n. 38 Precious Green | Light Your Nails! Oggi vi mostro uno smalto Astra che può venire comodo nel periodo natalizio. Astra myLaque n. 38 Precious Green è un bellissimo verde bosco dal finish al limite tra il metallico e il foil. Alla prima passata non è molto coprente, ma con una seconda è perfetto. Le pennellate non sono troppo evidenti, ma non spariscono del tutto. L’asciugatura è lenta, un top coat rapido aiuta di certo. Il colore è molto luminoso ed è perfetto anche in giornate un po’ cupe. La rimozione è il punto dolente: glitter dappertutto! Non me lo aspettavo, armatevi di pazienza e cercate di strisciare il meno possibile fuori dall’unghia. Today I’m swatching an Astra nail polish that might come handy during the Christmas season. Astra myLaque n. 38 Precious Green is a beautiful forest green. Its finish is somewhere between a foil and a metallic I would say. First coat is not enough for full coverage, but it gets perfect at second one. There are some brushstrokes left behind, not too visible but still there. Drying time is quite slow so you’d better use a fast drying top coat. Colour is super bright and it comes perfect during gloomy days. Removal is a pain here, you get silver glitter everywhere. I didn’t expect it. You gotta be careful and try not dragging your cotton ball (or whatever you are using) outside the nail itself. Pictured are two coats without top coat. Che dire? Davvero un colore natalizio! Mi piace molto. E non dimentichiamoci che è uno smalto 5-free, ovvero privo di resina di formaldeide, formalina, canfora, toluene e Dbp (Dibutyl phthalate), alla modica cifra di 1,90€! Ma dove lo troviamo uno smalto 5-free a questo prezzo? Un applauso ad Astra da questo punto di vista. Se volete vedere altri colori o avere maggiori informazioni vi rimando al sito web Astra. Come vi sembra questo colore? Avete già provato qualche smalto della linea myLaque di Astra? What can I say? It’s such a perfect Christmas green, I really like it. Plus it’s 5-free for only 1,90€ (2.00 USD). Who else is selling 5 free nail polish for less than 2 bucks? Thank you Astra for that! If you’d like to take a look at other colours or know more about Italian makeup brand Astra you can check their website. What do you think of this shade? Do you like it? I have a soft spot for metallic shimmers. They are my choice for gloomy days! It really is the perfect green for the holidays! $2?!?!?! What?!?! I've never heard of this brand but will definitely look them up! It's an Italian brand, I know they sell abroad but I have no clue where! I really don't see the brushstrokes. I just see the beautiful color! Oh my, it is a gorgeous shade of green. It really is the perfect Christmas green! I adore this on you! Definitely a perfect one for Christmas! Will come handy for sure! this would be fabulous for Christmas. I love the pop of silver. I like showing (and wearing!) a variety of brands! Love to hear it's appreciated. They are quite good, esp. keeping the price in mind! Thank you! Glad to hear that because I love green on my nails!